The mining industry is a vital contributor to national and global economies; never more so than at present with soaring demand for the commodities that it produces. It is a truly international business that depends on the trust and confidence of investors and other stakeholders for its financial and operational well-being. Unlike many other industries, it is based on depleting mineral assets, the knowledge of which is imperfect prior to the commencement of extraction. It is therefore essential that the industry communicates the risks associated with investment effectively and transparently in order to earn the level of trust necessary to underpin its activities. The aim of CRIRSCO (Committee for Mineral Reserves International Reporting Standards) is to contribute to earning and maintaining that trust by promoting high standards of reporting of mineral deposit estimates (Mineral Resources and Mineral Reserves) and of exploration progress (Exploration Results). CRIRSCO was formed in 1994 and for much of its life was an informal alliance of National Reporting Organisations (NROs) in participating countries (see "About CRIRSCO"). 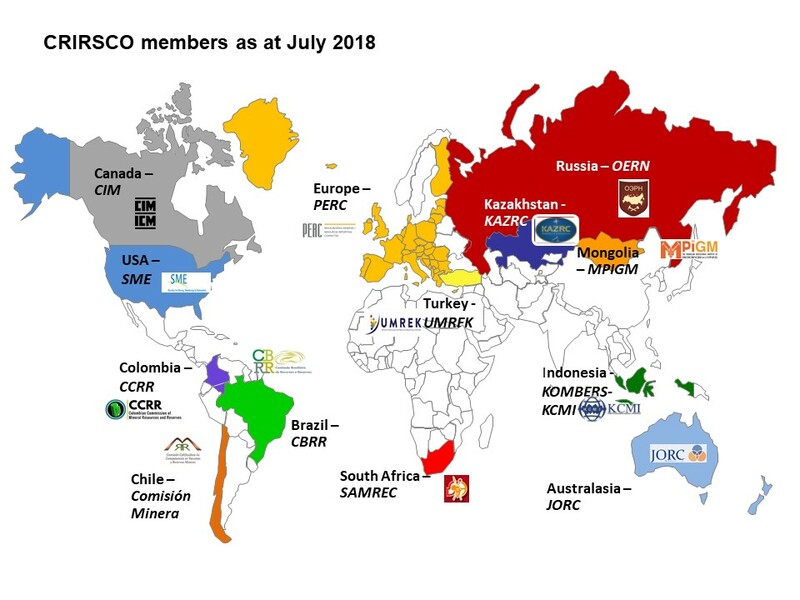 With the rapid increase in international activity associated with the mining industry in recent years, CRIRSCO has evolved to become a more rigorously constituted committee which is governed by its Terms of Reference and Organisational Statutes. Our current members represent Australia, Brazil, Canada, Chile, Colombia, Europe, Indonesia, Kazakhstan, Mongolia, Russia, South Africa, Turkey, USA, with the prospect of other regions and countries joining in future. CRIRSCO encourages other countries or regions to become members and has a Membership Application Policy and Process for intending members. CRIRSCO is currently involved in a number of initiatives which will impact on the future of the mining industry (see “ Current CRIRSCO Activities”). It has published and maintains on this web site the CRIRSCO International Reporting Template, first published in 2006. This is a document that represents the best of the CRIRSCO-style codes: reporting standards that are recognised and adopted world-wide for market-related reporting and financial investment. It is available free of charge for any country wishing to develop its own CRIRSCO-style reporting standard, and will be kept up to date to reflect new national or international developments. The CRIRSCO Template is also the basis for discussions with organisations including the IASB on standardising the approach of the extractive industries (oil, gas and solid minerals) to resource and reserve definition for financial accounting purposes. CRIRSCO exists because of the dedication of hard-working volunteers in NROs and the organisations that support the NROs. These are listed in “ Useful Links” and we take this opportunity to express our deep gratitude for their support. We would encourage anyone interested in the important field of classification and reporting of mineral assets to support, and participate through, these organisations and to raise issues of concern with CRIRSCO members.